On the sport's biggest stage, against the Americans' greatest rival, with all her teammates leaning eagerly over the boards watching her every move, the three-time Olympian came back to her forehand to finish off a dazzling, triple-deke move by sliding the puck into the net past the outstretched glove of Szabados for the deciding goal in the sixth round of a shootout thriller. "I knew when that went in that Maddie was going to stop the next one," Lamoureux-Davidson said. That would be 20-year-old goalie Maddie Rooney, who stuffed the last two Canadian shooters to wrap up a 3-2 victory Thursday that snapped the Americans' 20-year gold medal drought and ended Canada's bid for a fifth straight title in the first shootout in an Olympic women's final. 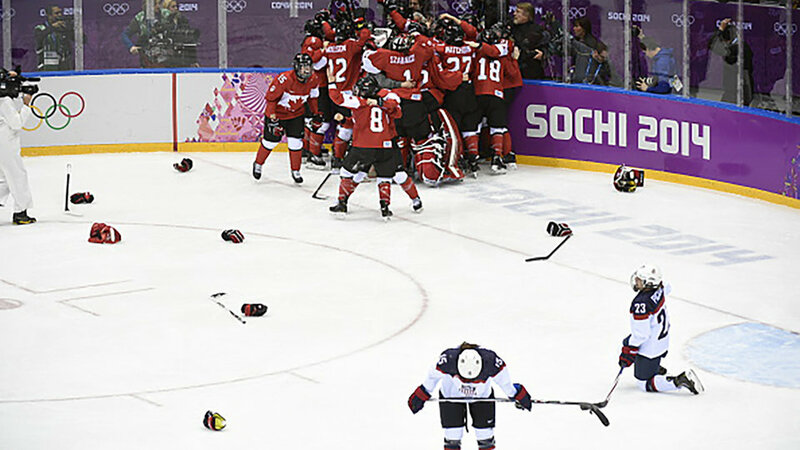 The Americans piled over the boards, throwing gloves in the air before piling on top of Rooney on the ice — 20 years after their last gold medal in women's hockey and 38 years to the day after the men's famous "Miracle on Ice" victory over the Soviet team in group play at Lake Placid. "Joy's the only word that comes to mind," said Gigi Marvin, a three-time Olympian and at 30 the oldest American on the roster. This victory capped a year that started with the Americans threatening a boycott of the world championships to secure more money and the same treatment that USA Hockey gives to the men's team. "They should make a movie on it," forward Hilary Knight said. "We had all the drama and everything. It's sort of a storybook ending to an incredible series of accomplishments." Nothing was more incredible than the move by Lamoureux-Davidson, who decided to use the deke called "Oops, I did it again " — something she had practiced uncounted times in practice, skating around tires set up on open ice to mimic defenders. "I'm just thrilled beyond words," the beaming Lamoureux-Davidson said with a U.S. flag draped around her shoulders and gold hanging on her chest. "I've butchered it a thousand times, just ran into tires, tripped over tires just working on my hands. Just glad it worked out this time." Marvin and Amanda Kessel also scored in the shootout, another nail-biter ending four years after Canada won its fourth-straight gold medal in Sochi after rallying to stun the Americans in overtime. That lasted only 2 minutes into the second when Irwin tipped a midair pass from Blayre Turnbull over Rooney's left leg for Canada. And when Morin lost the puck, Daoust grabbed it and passed to Agosta who hit Poulin for the wrister into the left side of the net at 6:55 for a 2-1 lead. Lamoureux-Morando tied it up with a breakaway with 6:21 left in regulation . Knight also had a goal and Rooney was spectacular, making 29 saves for the win. Rooney stopped the last two Canadian shooters in the shootout in Brianne Jenner and then Meghan Agosta on her second attempt. Pressure? Rooney's grin was clear to see throughout the shootout. "Right before she came down, I just looked over at the bench and saw my teammates like pointing at me, just one more," Rooney said. "And to have their support made it a whole lot easier. I just reacted to her, and then everything kind of went into a blur." The Canadians said they didn't like the shootout format , preferring overtime to settle a game of such magnitude. "We've trained so hard," Agosta said. "It's unfortunate this had to come down to a shootout. When it comes down to a shootout it can be anybody's game." The Americans had dominated the women's game in non-Olympic years, winning the last four and eight of the last 10 world championships, including a 3-2 overtime victory over Canada last spring. It only made the lack of gold at the Olympics all the more noticeable, and Canada has been in their way since losing the inaugural gold in Nagano in 1998. Canada had won 24 straight Olympic games to go along with those four consecutive gold medals — a streak of success in a women's team sport second only to the U.S. basketball team's current streak of six straight gold. Stauber went with Rooney in net after she won the only three games the U.S. took from Canada last fall during a pre-Olympic exhibition tour. And like Lamoureux-Davidson, the youngster delivered in the biggest moment. "Everything got into a blur, seeing my teammates sprinting at me," Rooney said. "It's an indescribable feeling."